Our online MCAT prep courses can be chosen based on your needs and/or budget. Our Gold Standard courses are offered as monthly subscriptions with instant access, cancel anytime, or with fixed fees for a period of 6 months or 1 year. All courses include a content review and there are options below which range from 1 to an unprecedented 20 full-length MCAT practice tests. All our online MCAT prep courses are designed to simulate the current version of the exam. If you are not looking for an online MCAT prep course but you are just looking for practice questions, click here: Gold Standard MCAT Question Bank. Note that all our programs come with single-user accounts. If you wish a bulk purchase for your institution or tutor service, please contact us directly for possible discounts at learn@gold-standard.com. For information about the MCAT, click here: What is the MCAT? High-yield online chapters from The Gold Standard MCAT followed by chapter review questions with helpful explanations. These high-yield eBooks cover Psychology, Sociology, MCAT Math, Physics, General and Organic Chemistry, Biochemistry and Biology. being charged for another month, you may cancel through your Paypal account. Additional 3 full-length new MCAT practice tests, thus, a total of 5 full-lengths. This program is automatically part of all of our Online MCAT Prep Courses but is also available separately for those who do not need a review of other subjects. A cost-effective, self-paced MCAT prep that suits any learning style. Choose one from among the newest edition of the following 3 boxed sets of books in color: (1) Kaplan MCAT Complete 7-Book Subject Review (3288 pages, ISBN 978-1506235486); (2) Princeton Review MCAT Complete Box Set (7 books, 2864 pages, ISBN 978‑0451487155); and (3) Examkrackers 10th Edition MCAT Complete Study Package (6 books, ISBN 978-1893858831). Each of these book sets provide a complete MCAT content review for Biochemistry, Biology, Physics, Math, General and Organic Chemistry, Psychology and Sociology. Depending on the package that you choose, you will have a total of 8,000+ practice questions with helpful solutions (see below for a breakdown of all practice questions). Online access begins instantly after payment. checkout and payment through PayPal. With this course, you will not require any other MCAT prep books, notes or materials to prepare for the MCAT! Save with us! Buy all your MCAT prep materials with us and take advantage of lower prices (we buy in bulk so that we can pass the savings on to you). 10,000+ practice questions with helpful explanations from Gold Standard, AAMC, Examkrackers and Next Step (current breakdown) ; note that these practice questions include all of the official AAMC section banks and questions packs. Brand NEW Bonus: 10 Weekly Tutorials Online! Meet weekly for an hour with a small group online and an instructor from our team (medical student or doctor) to learn strategies based on PBL and improve your weaknesses. Keep on track with your study objectives. Live and interactive online tutorials are currently being booked for Sundays at 8 pm EST. Sessions are recorded for your convenience. Recorded and live sessions will be available to you for up to 1 year. *Please note: It is possible that a fraction of 1% of our practice questions are repeated. We will continue to identify and remove repeats except those in the abbreviated test GS-Free. Additionally, Khan Academy questions are never counted towards the total number of MCQs in any of MCAT-prep.com's programs. They are linked only to improve your study efficiency with quality, reputable materials. * Kaplan MCAT Complete 7-Book Subject Review includes: 1) MCAT Behavioral Sciences Review; 2) MCAT Biochemistry Review; 3) MCAT Biology Review; 4) MCAT Critical Analysis and Reasoning Skills Review; 5) MCAT General Chemistry Review; 6) MCAT Organic Chemistry Review; 7) MCAT Physics and Math Review; and 8) three full-length online practice tests. Kaplan MCAT content is © Kaplan, Inc. Note: It is possible that a fraction of 1% of our practice questions are repeated. We will continue to identify and remove repeats except those in the abbreviated test GS-Free. Also note that our ‘Current Grand Total’ does not include the hundreds of additional practice questions which are part of this program, specifically those included in the GS iPhone or Android app. Additionally, Khan Academy questions are never counted towards the total number of MCQs in any of MCAT-prep.com's programs. They are linked only to improve your study efficiency with quality, reputable materials. 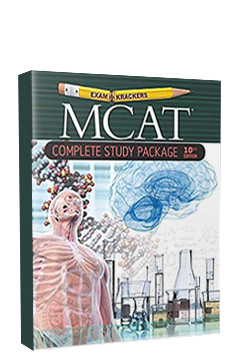 * The Princeton Review MCAT Complete Box Set includes: 1) MCAT Biology and Biochemistry Review; 2) MCAT General Chemistry Review; 3) MCAT Organic Chemistry Review; 4) MCAT Physics and Math Review; 5)MCAT Psychology and Sociology Review; 6) MCAT Critical Analysis and Reasoning Skills Review; and 7) three full-length online practice tests. The Princeton Review MCAT content is © TPR Education IP Holdings, LLC. *Examkrackers MCAT Complete Study Package includes: 1) Reasoning Skills: Verbal, Research and Math; 2) Biology 1 Molecules - Biochemistry, 3) Biology 2 Systems; 4) Psychology & Sociology; 5) General and Organic Chemistry; and 6) Physics. Examkrackers content is © Osote Publishing. This page is currently being updated. Sorry for the inconvenience. *Please note: It is possible that a fraction of 1% of our practice questions are repeated. We will continue to identify and remove repeats except those in the abbreviated test GS-Free. Also note that our ‘Current Grand Total’ does not include the hundreds of additional practice questions which are part of this program, specifically those included in the GS iPhone or Android app. Additionally, Khan Academy questions are never counted towards the total number of MCQs in any of MCAT-prep.com's programs. They are linked only to improve your study efficiency with quality, reputable materials. 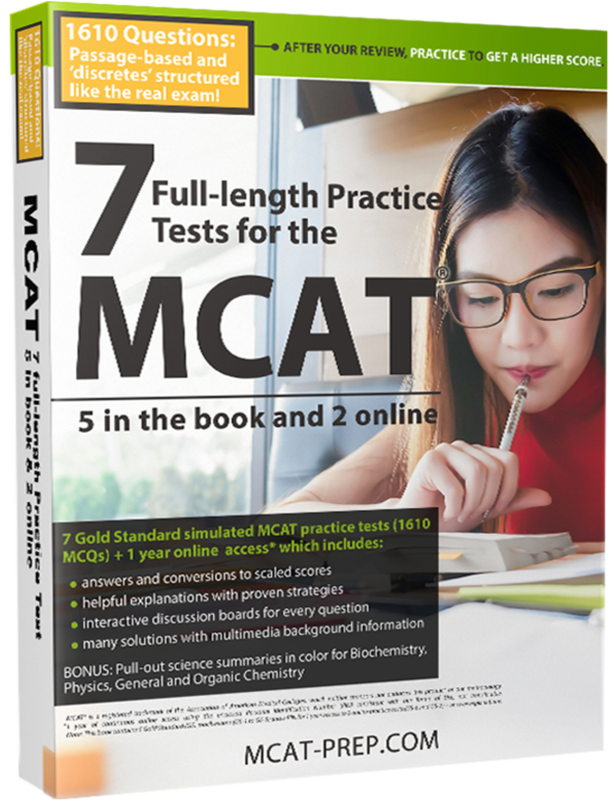 **MCAT is a registered trademark of the Association of American Medical Colleges (AAMC), which does not endorse this study guide or our methodology. *MCAT is a registered trademark of the Association of American Medical Colleges (AAMC), which does not endorse this study guide or our methodology. All AAMC materials are included in the new Gold Standard MCAT Platinum Package. The current AAMC materials include 4 full-length exams, the Official Guide, Official MCAT Flashcards and the Official MCAT Question Pack Bundle. ***Next Step Prep Tests includes online full-length practice tests NS-1, 2, 3 and 4, and are ® Next Step Test Preparation LLC. **** Kaplan MCAT Complete 7-Book Subject Review includes: 1) MCAT Behavioral Sciences Review; 2) MCAT Biochemistry Review; 3) MCAT Biology Review; 4) MCAT Critical Analysis and Reasoning Skills Review; 5) MCAT General Chemistry Review; 6) MCAT Organic Chemistry Review; 7) MCAT Physics and Math Review; and 8) three full-length online practice tests. Kaplan MCAT content is © Kaplan, Inc.
***** The Princeton Review MCAT Complete Box Set includes: 1) MCAT Biology and Biochemistry Review; 2) MCAT General Chemistry Review; 3) MCAT Organic Chemistry Review; 4) MCAT Physics and Math Review; 5)MCAT Psychology and Sociology Review; 6) MCAT Critical Analysis and Reasoning Skills Review; and 7) three full-length online practice tests. The Princeton Review MCAT content is © TPR Education IP Holdings, LLC. ****** Examkrackers MCAT Complete Study Package includes: 1) Reasoning Skills: Verbal, Research and Math; 2) Biology 1 Molecules - Biochemistry, 3) Biology 2 Systems; 4) Psychology & Sociology; 5) General and Organic Chemistry; and 6) Physics. Examkrackers content is © Osote Publishing. † Please note: It is possible that a fraction of 1% of our practice questions are repeated. We will continue to identify and remove repeats except those in the abbreviated test GS-Free. Also note that our ‘Current Grand Total’ does not include the hundreds of additional practice questions which are part of this program, specifically those included in the GS iPhone or Android app. Additionally, Khan Academy questions are never counted towards the total number of MCQs in any of MCAT-prep.com's programs. They are linked only to improve your study efficiency with quality, reputable materials. MCAT - prep.com, "The only prep you need"™, is run by RuveneCo Inc. - a leader in test prep materials. © 2019 MCAT-prep.com. All Rights Reserved. 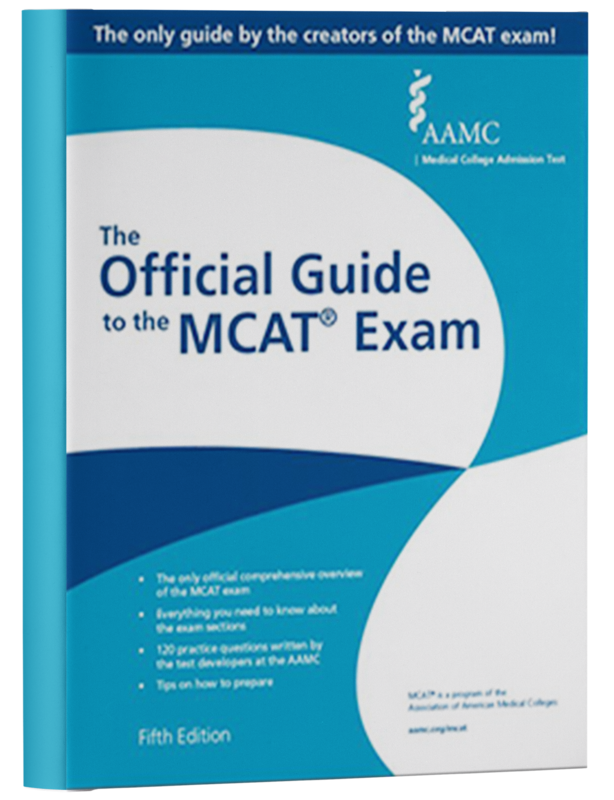 *MCAT is a registered trademark of the Association of American Medical Colleges (AAMC), which does not endorse this study guide or our methodology.